Transforming Families Through Birth. This is the core philosophy of Alaska Family Health and Birth Center. This, above everything else I knew of the place, is what brought me to Fairbanks to work with these amazing midwives. The deep and abiding knowing that this was not just about a birth, not just about a baby, or a mother, but about a family. About building, and supporting, and educating, and creating, families. Because without a healthy family, you cannot have a healthy child, or a healthy mother. Without a healthy family, you cannot have a healthy community, or a healthy world. In every encounter we have with clients, it is clear that AFH&BC is about family centered care. This is true as well of most midwives across the world. From the first consults and appointments, where we encourage spouses and children, to encouraging fathers to take an active role in pregnancy and birth, to birth with siblings standing eagerly by the tub to catch a first glimpse of that new addition, midwives embrace family. But family centered care is not just about including families…it is about transforming families. As midwives, we take a young couple and walk them through the first questions of “what do we, as parents, want for our child?” We help them consider questions of healthcare, of parenting, of boundaries with their own parents. We help them realize that, much like planning a wedding, this is not about the event, but about the results of the event. This is not just about the birth, but about the baby…about becoming parents, and raising a child. These are big, big questions compared to the impact of one day. We do not diminish the importance of that one day…we would not exist if we did. We understand fully the significance to both a mother and a child how that child comes into the world. But we also know so very well that there are bigger things at stake. Like how do they become a family? How do they navigate the hard decisions, the unknown turns, the times of sadness and of joy? This is another reason most midwives have longer and more appointments, both during pregnancy and during the postpartum period. This kind of care and education is time intensive. Many birth centers offer group prenatal care, like you can find in our Arctic Family Circle classes. These long prenatal appointments connect women to other women, and allow the midwives time to educate on parenting, breastfeeding, co-sleeping, and so many other topics that fill parent’s minds. 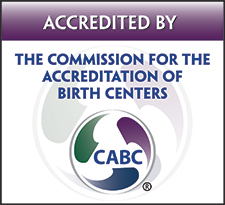 At our birth center, as in many others, we see women at 1 week, 2 weeks, 4 weeks, 6 weeks, and 8 weeks postpartum. We understand the importance of this postpartum time as families transition into their new roles. We try to be there to support, and guide, and inform. As midwives we are not magicians, and we are not all-knowing. We cannot make this easy for anyone. But we understand that with tools and knowledge, most tasks go from insurmountable to manageable, peppered with moments of ridiculousness. This is our goal for our families. To help provide them with the tools and the knowledge to navigate pregnancy, birth, and parenthood. In their own way. With their own values at the forefront.